I released FireBible 1.3 last weekend, with the following key fixes. If you already have FireBible installed, you can check for updates, or head on to the FireBible page to get it. Will automatically download and install JSword. Can automatically install books if none found. You can now type book names first in Ubiquity (don’t need to start with ‘sword’). Fixed Ubiquity command installation issues. Fixed issue with Sun’s Java 7 browser plugin. Raised compatibility to work with more recent Firefox versions. For those of you having issues getting Ubiquity to work with recent Firefox releases, please download this file and open it (File > Open File…) using Firefox. This is a version of Ubiquity being maintained by satyr. Getting FireBible working with OpenJDK / IcedTea browser plugin (still only works with Sun’s VM and plugin) but OpenJDK and IcedTea compatibility seems more possible than GCJ support. 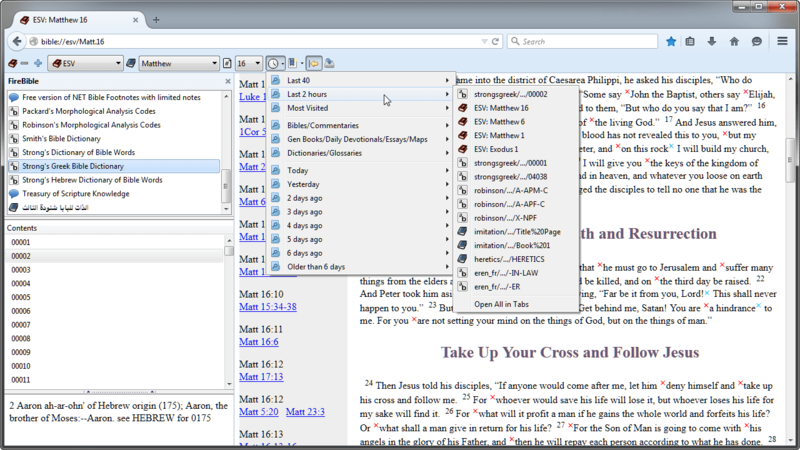 Integration of a newer version of JSword with av11n support (which is still being developed) so I can finally support Catholic Bibles. Support for selfcare.ndc.bsnl.co.in, thanks to Rohit Singh for the help. The “charged usage” is displayed as 0, (at least for his account) and this is the value DataFox uses to display the progress; so if your account has this same problem, you will not see a progress bar at all and the surplus calculations will be off. Hopefully BSNL fixes this problem soon. If you manually enter selfcare.wdc.bsnl.co.in in the domain field, DataFox might work for that too because they appear to use the same backend. Unfortunately, because nobody has sent me their credentials, I have been unable to test this or add support if required. Increased Firefox compatibility range to 15 – I don’t want to be forced to release a new version every couple of months with these monthly major version changes. As always, if you want support for the selfcare portals, please send me your credentials or I have no way of implementing support and I will have to simply ignore and / or delete your comments.